James Hale studied BSc Geology at Birkbeck through distance learning after 14 years out of education. 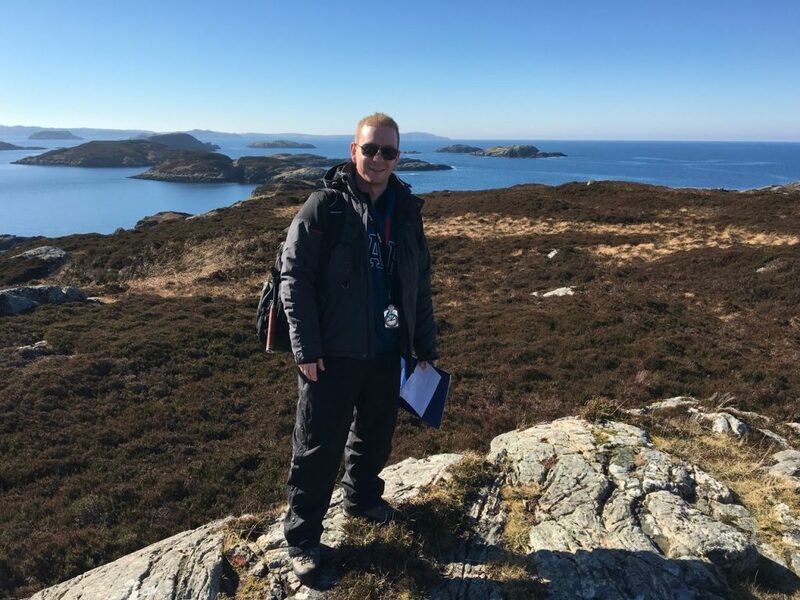 He discusses how his degree has helped him transform his life, having gone on to both further study and a new job in the field of Earth Sciences. I started the BSc (Hons) Geology degree at Birkbeck in 2014 whilst working as a sales consultant for a large, multi-national workshop consumables company. I had worked in sales for over ten years and really wanted a career change, but I had no idea what to do instead of sales. I have always been passionate about Science, Earth Science in particular but I never saw it as a possible career, as I left school with only a set of GCSEs, no A-levels or degree. After a particularly bad day in work, my fiancée suggested I do a little research into Earth Science degrees. I came across various online distance learning geology degrees but Birkbeck was the only one with accreditation from the Geological Society of London and the only one using Panopto to deliver the lectures. The accreditation was important to me because I wanted to be able to establish a career using the degree and the fact that Panopto was used to record the lectures in HD quality made me feel like I was in the classroom. The staff were excellent, very supportive and clearly understood that many of us in the class had not been in any sort of education for quite some time. For me, it had been 14 years to be exact so naturally I was apprehensive about starting a degree. After watching the recording of the induction evening before the start of the course, I felt very much at ease. By the end of the first lecture I was hooked, my mind was immersed and I was extremely glad that I decided to study Geology at Birkbeck. I originally started the degree on a part-time basis and transferred to full-time after the first year which enabled me to complete in 2017 after three years. The distance learning aspect benefited me because I have a young family, therefore I needed the flexibility to be able to work on a full-time basis and be able to study around them in the evenings and on weekends. The degree gave me a strong, renewed sense of purpose as well as the immense personal satisfaction of completing something as challenging and life-changing as a degree. I gained invaluable academic skills such as report writing and data processing, a lot of which are transferable, as well as first-class field skills. The degree has made me employable in a scientific environment, so much so I am about to start work at a major UK university as a Senior Technical Officer – Earth and Biological Sciences. I am also a year into a part-time MSc which I am studying online at a world-renowned oil and gas industry focused University. My overall ambition is to progress to lecturer and to conduct my own research in the field of geology. I would advise anyone else thinking about studying via distance learning with Birkbeck to go for it! Provided you put in the hard work, you can achieve your goals. The study process is made as flexible and accommodating as possible by the college, the course content is both interesting and engaging, the staff are very helpful and supportive, plus if you choose geology you’ll remember the amazing field trips for the rest of your life! I can’t thank the Department of Earth and Planetary Sciences staff enough for literally helping me change my life.